According to multiple reports, the Mets and Todd Frazier have agreed to a two-year contract worth $17M. Less than I thought he’d get! Even in this free agent market. The Yankees have been connected to Frazier throughout the offseason, though it never seemed they were seriously trying to re-sign him. Frazier, 32 next month, played 66 games with the Yankees last season after coming over from the White Sox in mid-July. He hit .222/.365/.423 (114 wRC+) with eleven homers, played strong defense, and was of course an all around great clubhouse dude. Frazier seemed to genuinely love being a Yankee and made it known he wanted to come back. The Yankees are said to be in the market for a free agent infielder and, even with Frazier off the board, there is no shortage of options. Mike Moustakas, Neil Walker, Eduardo Nunez … plenty of guys still out there. Of course, the $197M luxury tax threshold looms, and the team only has about $12M to spend, assuming they set aside $10M for midseason additions. At the moment Miguel Andujar is penciled in as the starting third baseman and I hope he gets the job. Looking forward to another Baby Bomber joining the lineup. I don’t blame the Yankees for monitoring the market for veteran infielder insurance, however. So long, Todd. You were a cool dude and a good Yankee for the few weeks you were actually a Yankee. Pitchers and catchers report next week and still so many free agents remain unsigned. There are over a hundred of them, but as far as legitimate big leaguers go, there’s maybe 50 free agents out there looking for a job. That’s a lot! They should all be signed and preparing for the start of camp by now. Instead, they’re still unemployed. Crazy. The Yankees have about $22M to spend under the $197M luxury tax threshold, though when you remove the $10M they’re planning to set aside for midseason additions, it’s more like $12M. That’s a lot! And with the free agent market moving so slowly, the Yankees still have an opportunity to spend that money on a quality player. Usually by now all the best free agents would be signed. Not this year. We know the Yankees want another starting pitcher. They went after Gerrit Cole, Chris Archer, Michael Fulmer, and Patrick Corbin at various points this winter. The Yankees don’t just want another starter, they want a really good starter. Even in this free agent market, I’m not sure that $12M is enough to land a quality starter though. Would Alex Cobb or Lance Lynn really be available at that price? If so, why haven’t they signed already? On one hand, “considering” a free agent is meaningless. Every team considers every free agent at some point. On the other hand, these reports indicate the Yankees are monitoring the market in case something comes together at what they consider a bargain price. That’s usually how Brian Cashman & Co. operate. If something is available on their terms (see: Stanton, Giancarlo), they’ll pounce. If not, they’ll stay the course. A few things about the infielder search. 1. Kipnis might come surprisingly cheap. Even as successful as they’ve been the last few years, the Indians are notoriously cash-strapped, and Kipnis’ contract is standing in the way of other moves. He’ll make $13.5M in 2018 and $14.5M in 2019 before a $16.5M club option ($2.5M buyout) comes into play for 2020. That’s a minimum of $30.5M from 2018-19. He’s not cheap, especially for the Indians. The Yankees are seemingly more concerned about the luxury tax payroll than their actual payroll. Kipnis has $30.5M in real money coming to him the next two years, but his luxury tax hit is a much more palatable $8.75M based on his six-year, $52.5M extension. That fits nicely under the luxury tax threshold and still leaves the Yankees about $13M total to spend on whatever. A pitcher, the trade deadline, whatever. Kipnis will turn 31 in April and he hit .232/.291/.414 (82 wRC+) with 12 homers in 90 games around a series of hamstring problems last season, so you can understand why the Indians might be worried his best years are behind him. If they can unload Kipnis and his salary, they can put Jose Ramirez at second and Giovanny Urshela at third, and spend the savings on whatever else they need. Given his salary, the Indians might be willing to part with Kipnis for something less than a big return. Based on the Dee Gordon salary dump, three low-to-mid-range prospects might do it. What would the Yankees do with Kipnis? Well, use him as a stopgap at second base, for starters. He’d make it easier to send Gleyber Torres to Triple-A to shake off the rust after elbow surgery buy an extra year of control. And I guess the Yankees would also hope Kipnis can play some first and third? He’s never played either position, but he does have a little outfield experience. Teaching a player a new position(s) on the fly is never easy, but it’s not impossible. Kipnis’ lefty bat would balance the lineup and allow him to take aim at the short porch. There’s a fit. Not a perfect fit, but it could work. … and that makes him a wonderful fit for Yankee Stadium. Is that enough to a) block Miguel Andujar, and b) give up two draft picks (second and fifth rounder) and $1M in international bonus money to sign him? Maybe it is. The Yankees are trying to win the World Series and Moustakas’ certainty might be better than Andujar’s upside. I dunno. Anyway, if Moustakas ends up taking a one-year contract, other teams figure to outbid the Yankees given the luxury tax plan. If the Yankees are going to sign a veteran, I’d prefer Frazier, who’s a better defender than Moustakas, going to post similar OBP and power numbers, and won’t cost draft picks and international bonus money. 3. Get an infielder, but don’t block the kids. The Yankees have been going young pretty much wherever possible, which is the main reason we kinda have to believe them when they say they are willing to start the season with Torres at second and Andujar at third (or Tyler Wade, or Thairo Estrada, etc.). That doesn’t mean they won’t add a veteran, but it stands to reason they’ll want to add a veteran without blocking the kids. That’s not easy. How do you do that, exactly? If they trade for Kipnis, what happens when Torres (or Wade or Estrada) is deemed ready? If they re-sign Frazier, how do they made room for Andujar when the time comes? I’m a “just get the talent and it’ll work itself” guy, so I don’t consider this a huge deal. For the Yankees though, they have to keep this stuff in mind. Where does Kipnis fit after Torres gets called up? How do Frazier and Andujar co-exist? They don’t have to have an answer right now. It’s just something to keep in mind. 4. Versatility is important. This ties back to the last point. If Kipnis can handle first and/or third base, then he could become something of a super utility guy when Gleyber and Andujar arrive. He provides protection behind the kids and backs up Greg Bird. Frazier can’t play second. (He says he can, but I’m not buying it.) It’s first or third only for him. 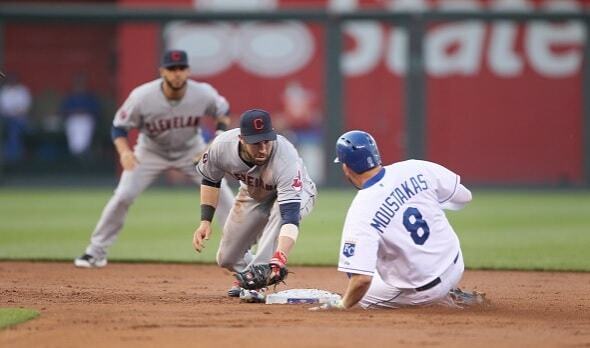 Moustakas is third base only. Walker played first, second, and third last year, and he switch hits! Another reason versatility is important: The pitching staff. The Yankees went with an eight-man bullpen for long stretches of time last season, which means a three-man bench, and one of the three is the backup catcher. You need players who can play multiple positions. The Yankees might also go with a six-man rotation at times this year, even if they only call up a sixth starter for one day to make a start before sending him right back down. They’ve played with a short bench quite often the last two or three years, and I have no reason to believe that will end this season. The more versatile the veteran infielder, the better. The Yankees have $12M or so to spend under the luxury tax threshold before we even get to their $10M buffer for midseason additions, and that $12M is going to get spent. I’m sure of it. The Yankees will do what they always seem to do this time of year. They’ll see which free agents (or trade candidates) slip through the cracks and become “value buys.” Last year it was Chris Carter and hey, that didn’t work out. Doesn’t mean you stop trying though. You could make a case any of the available infielders makes sense for the Yankees. Kipnis is a lefty bat with a luxury tax friendly contract and some versatility. 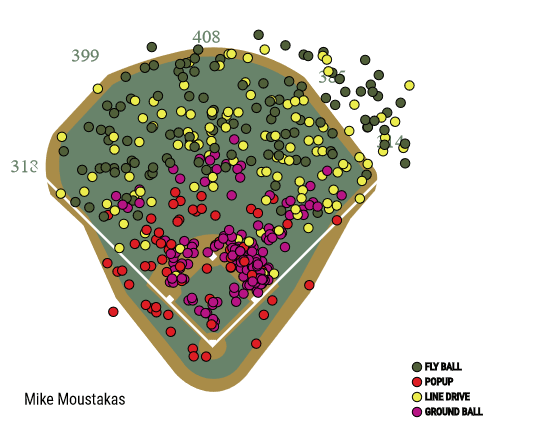 Moustakas will cost nothing but cash and he’ll abuse the short porch. Frazier is available for nothing but cash and he brings energy and production. Walker is a switch-hitter and versatile. Nunez makes gobs of contact and is versatile. Josh Harrison brings energy and versatility. They all make some degree of sense in their own way. Torres and Andujar are the future though, and any move the Yankees make will be made with those guys in mind. I would be stunned if the Yankees signed, say, Moustakas to a three-year contract that leaves Andujar with no place to play. Same with Walker at second base. I expect a short-term deal only. Balancing winning now with breaking in Torres and Andujar won’t be easy! But this is a good problem to have. The Yankees are in position to get a good deal on an infielder, and if it doesn’t happen, well they’ll just go with their top 100 caliber prospects. With six weeks to go before Spring Training, the Yankees have openings at second and third bases, and no shortage of ways to fill them. They could stay in house with guys like Ronald Torreyes, Gleyber Torres, and Miguel Andujar, or they could dive into the free agent or trade markets for help. There’s an argument to made for both approaches. One of the best available free agent infielders is Todd Frazier, who was briefly a Yankee last season and has made it no secret he wants to stay in New York. Frazier seemed to genuinely love being a Yankee. According to Brendan Kuty, the two sides remain in contact, but Frazier wants a multi-year contract and the Yankees want to stay under the $197M luxury tax threshold, so the financials could be an issue. Frazier, 32 next month, hit .213/.344/.428 (108 wRC+) with 27 home runs overall in 2017, including .222/.365/.423 (114 wRC+) with eleven homers in 66 games with the Yankees. He’s a flawed hitter, no doubt, but he is productive, he can play a fine third base, and he’s an asset in the clubhouse. Are those enough reasons to bring him back? Let’s talk this out. Like I said, Frazier is a flawed hitter but he is productive. He hits for power and he draws walks, and his strikeout rate is basically league average. There’s also reason to believe Frazier will be more comfortable in his second season with the Yankees. More comfortable with the ballpark, the division, his teammates, the city, the works. A midseason trade can be overwhelming. It’s a lot of change in a short period of time. The Yankees don’t need Frazier to hit in the middle of the order. They can stash him in the bottom third of the lineup and let him pop 20-something homers, maybe more given his extreme fly ball tendencies and all the hitter friendly ballparks in the AL East. A right-handed hitter who pulls the ball that much won’t take advantage of the short porch, but that’s okay. Frazier is not lacking power. He’ll hit the ball over the fence to left field just fine. I’m surprised the Red Sox aren’t showing more interest in Frazier given how many fly balls he pulls to left field. Seems like a good fit for Fenway Park. Bringing Frazier back would accomplish two things, in theory. It would give the Yankees a solid complementary player, and also allow youngsters like Torres and Andujar develop at their own pace. I love prospects as much of the next guy, but even the most talented prospects can falter. What if Gleyber pulls a 2017 Dansby Swanson in 2018? Frazier would give the Yankees protection, and he won’t break the bank. I suppose the case against Frazier starts with his flaws as a hitter. He is an extreme fly ball hitter, which is good for power numbers, but it can also hurt your batting average. As we saw this year, Frazier is prone to weak fly balls and pop-ups. They’re average killers. Frazier has hit .220 in his last 1,242 plate appearances because of those weak fly balls and pop-ups. The Yankees ran into some problems last season where they struck out in bunches — their team 21.8% strikeout rate was only 13th in MLB and basically league average (21.6%), believe it or not — and adding the totally awesome Giancarlo Stanton won’t solve that problem. Frazier doesn’t strike out a ton (21.7% in 2017), but a pop-up and a strikeout are damn near the same thing. His low average could compound the team’s offensive weakness. Secondly, Frazier will turn 32 next month, so he’s getting to the point where you have to start worrying about age-related decline. And what is Frazier’s decline going to look like? His average is already low and if he starts to lose some power, he could morph into a below average hitter quickly. And if his defense slips too, well, it won’t take long for the natives to get restless. A short-term contract would mitigate the risk. The Yankees wouldn’t be locked into Frazier long-term, so if he does begin to decline, they can move on quickly. That said, thanks to the luxury tax plan, every dollar the Yankees spend on Frazier is a dollar they can not spend elsewhere. A low-average hitter at increasing risk of age-related decline might not be the best use of finite payroll space. Ultimately, the decision to re-sign or not re-sign Frazier is going to come down to price. If he sticks with his multi-year contract demand and wants, say, $10M to $12M per season, it’s difficult to think Frazier will wind up back with the Yankees. But, if his market fails to materialize and he’s still looking for a job in February, perhaps he would be open to a one-year deal at, say, $8M or so. You never know. He’d get to stay close to home and have a chance to win, and that could appeal to him. Part of me worries Frazier is getting overrated because he’s a high-energy guy who is easy to root for, plus he had some big hits in the postseason. Don’t get me wrong, being a great clubhouse guy has define value and should not be overlooked. At the same time, there were a lot of complaints about Frazier’s pop-ups and cold stretches following the trade. He can be a frustrating hitter, for sure. As the seventh or eighth place hitter, the Yankees could probably live with Frazier’s low batting average and weak pop-ups as long as he socks the occasional dinger and plays a solid third base. And if someone like Andujar forces the issue, Frazier is versatile enough to play first base or maybe even left field in addition to DH, so he wouldn’t be blocking anyone. I think Frazier’s market is worth monitoring. If he’s still looking for a job later in the offseason, then it would be time to pounce. Right now, I don’t think it makes sense for the Yankees to come in with a market rate offer. There’s no reason to do that given how slow the free agent market is moving in general. The Yankees acquisition of Todd Frazier served as a reminder of just how quickly Brian Cashman works. Jon Heyman reported that the team was interested in Frazier (and David Robertson) on July 16, and Frazier (and Robertson and Tommy Kahnle) were acquired less than forty-eight hours later. In the grand scheme of things, it was the move that signaled that the Yankees would be buyers this year, filling the gaping void at first base and doubling-down on a dominant bullpen – and it worked out quite well. Who Said Anything About First Base? A revolving door at first and a seemingly endless stream of rumors demonstrated just how unsettled the Yankees infield was well into July, and Frazier’s name had popped-up in that respect more than a few times. Most every outlet viewed his acquisition as a move made to stabilize first base, but it only did so in a roundabout way, as Frazier did not play a single inning there for the Yankees. Instead, he took over as the starting third baseman, with Chase Headley and his questionable-at-best defense moving across the diamond. It shouldn’t have come as a shock that Frazier manned third base, though. Headley had been a poor defender at the position more often than not as a Yankee, and this organization has prided itself on strong glovework in recent years. Frazier, on the other hand, has been a strong (albeit occasionally error-prone) third baseman for the better part of his career; to wit, he has a 6.0 UZR/150 and 6.5 DRS/150 in 6900 innings at the position. And he played the part following the trade, saving 6 runs in 539.2 innings by DRS’ reckoning. Frazier was batting .207/.328/.432 (104 wRC+) with 16 HR in 335 PA prior to the trade. That’s not too far off of his 2016 season, wherein he hit .225/.302/.464 (104 wRC+) with 40 HR in 666 PA. He was a useful thumper, to be sure, but not the middle of the order threat that all of those home runs would suggest. It was worth noting, though, that his walk rate had jumped rather dramatically, from 9.6% in 2016 to 14.3% with the White Sox this year, which helped make up for his dip in batting average. Luckily for the Yankees, they didn’t need him to be a big-time run producer – they just needed stability. And he gave them a bit more. He started out slow following the trade, slashing a powerless .216/.356/.297 (87 wRC+) to close out July. Frazier had just one extra base hit in his first two weeks with the team, and it almost felt like more of the same. His bat was better in August, but still a bit disappointing – he hit .221/.352/.395 (104 wRC+) with 4 HR. The power was coming back, but it was still a tick under what we expected. And then the calendar flipped to September, and Frazier’s bat came alive. He slashed .225/.385/.521 (139 wRC+) with 6 HR and nearly as many walks (15) as strikeouts (17) in the season’s last month, as he helped the Yankees wrap-up home field advantage in the Wild Card game. He was also the standard-bearer for the team’s love of the thumb’s down celebration, and the de facto cheerleader from the bench down the stretch and throughout the playoffs. All told, Frazier hit .222/.365/.423 (114 wRC+) with 11 HR in 241 PA in pinstripes. Todd Frazier is a free agent as of this writing, but he has made his interest in returning to the Yankees fairly clear; whether or not the Yankees have room on the roster (and/or payroll) to retain his services is another issue entirely. 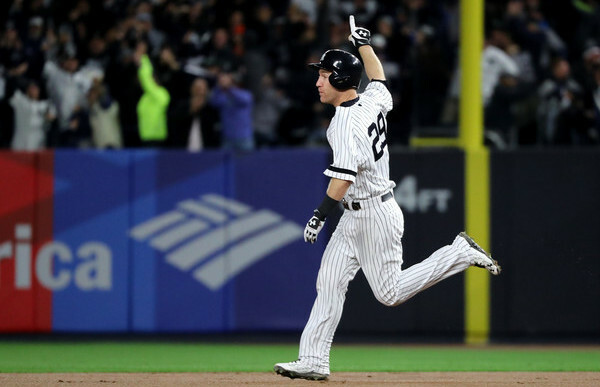 I would be surprised if Frazier ended up back in pinstripes next year, as the team preps its full-court press for Shohei Otani, and likely hopes to have room on the roster for Gleyber Torres and Miguel Andujar if and when they are ready for a shot. Stranger things have happened, but I just don’t think Cashman and Co. see it as a fit.